Are their two favorite things red wine and chocolate? Well, you are in the right place. Our Mondavi Private Selection Merlot is the centerpiece to this fantastic gift basket. It's bright aromas and flavors of cherry, plum and strawberry are going to taste delicious paired with the sweet and rich flavors of the chocolate and cookies included. Featuring Ghirardelli Milk Chocolate Carmel Premium Squares, Lind White Chocolate Truffles, Primo Dolce Chocolate Truffle Cookies and so much more. A gift that they won't want to share. 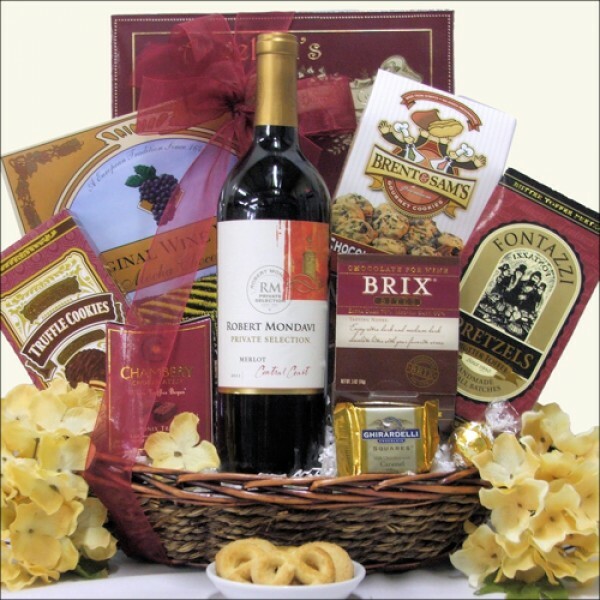 ...in an Oval Braided Gift Basket with Wooden Handles.